Congenital duodenal atresia and stenosis is a frequent cause of intestinal obstruction occurring in 1/5,000-10,000 live births and affecting boys more commonly than girls. In more than ½ of the cases, other associated congenital anomalies are seen with trisomy 21 in approximately 30% cases. On the other hand, jejunoileal atresia occurs in approximately 1 in 5,000 live births with equal incidence in males and females. Prematurity is associated in about 33% of the cases. The combination of the two is rare. A 3-day-old female child, first in birth order, delivered at term by lower segment caesarean section presented with bilious vomiting since birth. On examination, the child was warm and active. The upper abdomen was distended, and nasogastric tube showed bilious aspirates. X-ray abdomen revealed "double bubble appearance." 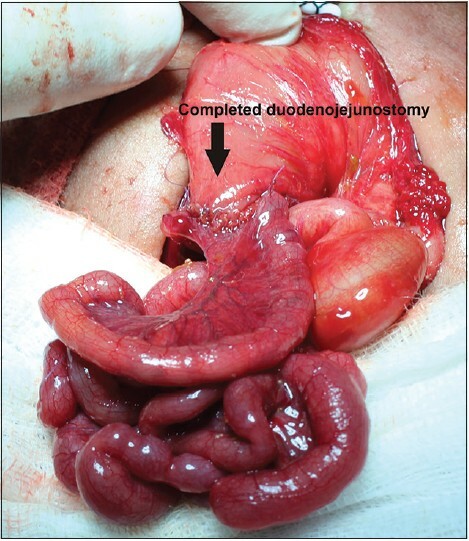 Exploratory laparotomy revealed post ampullary atresia of the duodenum with dilated proximal duodenum and stomach [Figure 1]. Furthermore, there were multiple jejunal atresias and apple peel appearance of the remaining ileum [Figure 2]. About 20 cm of jejunum containing three atretic segments was excised, and side-to-side duodenojejunostomy was performed [Figure 3]. The remaining ileum was found spiraling around a straight retrograde vascular pedicle showing an "apple peel" configuration [Figure 4]. The rest of the intestine was normal. A trans-anastomotic tube was left for early feeding. Distal atresias were excluded by instilling saline in the distal gut. Postoperatively the child recovered well. Oral feeding was started from 6 th postoperative day. The association of duodenal atresia with multiple jejunal atresias and apple peel appearance of the mesentery is extremely rare. Our case did not have any cardiac malformations or any other associated congenital anomalies generally seen in patients with duodenal atresia. 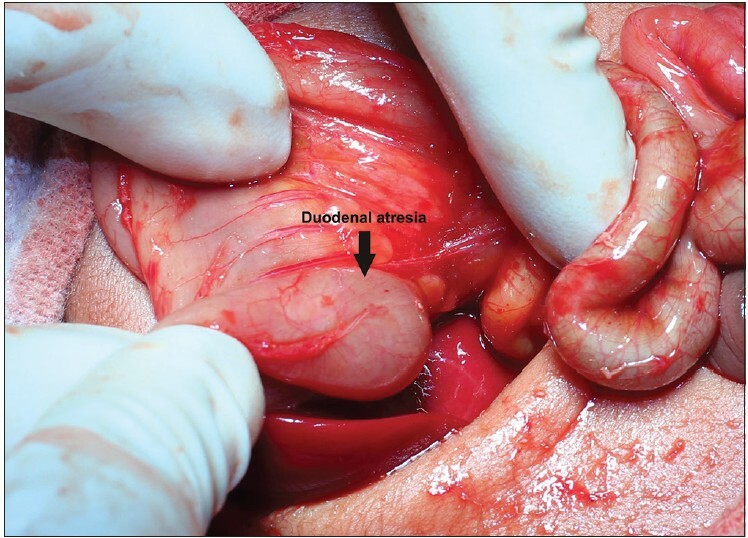 This association of duodenojejunal atresias might suggest some vascular accident in late gestation leading to duodenal atresia contrary to normally accepted theory of failure of recanalization. There are anecdotal reports of similar malformation. Pathak et al. reported a case of duodenal atresia with apple-peel appearance of the proximal jejunum. However, in their case, there was no other intestinal atresia. Ahmad et al. reported a case of duodenal atresia with an apple peel configuration of the ileum and absent superior mesenteric artery. But both these cases did not have any other intestinal atresias. Weber et al. reported a case of duodenojejunal atresia with an apple peel configuration of the ileum and absent superior mesenteric artery. They also suggested that in rare circumstances vascular accidents may be the underlying cause of duodenal atresia. Association of duodenal atresias with multiple jejunal atresias with apple-peel appearance of the remaining ileum is very rare. Such occurrence may be suggestive of vascular insult in late gestation leading to duodenal atresia. Kimura K, Loening-Baucke V. Bilious vomiting in the newborn: Rapid diagnosis of intestinal obstruction. Am Fam Physician 2000;61:2791-8. Grosfeld JL, Rescorla FJ. Duodenal atresia and stenosis: Reassessment of treatment and outcome based on antenatal diagnosis, pathologic variance, and long-term follow-up. World J Surg 1993;17:301-9. Dalla Vecchia LK, Grosfeld JL, West KW, Rescorla FJ, Scherer LR, Engum SA. Intestinal atresia and stenosis: A 25-year experience with 277 cases. Arch Surg 1998;133:490-6. Tandler J. Zur Entwicklungsgeschichte des Menschlichen Duodenum in Fruhen Embryonalstadien. Morphol Jahrb 1900;29:187-216. Santulli TV, Blanc WA. Congenital atresia of the intestine: Pathogenesis and treatment. Ann Surg 1961;154:939-48. Gahukamble DB, Adnan AR, Al Gadi M. Distal foregut atresias in consecutive siblings and twins in the same family. Pediatr Surg Int 2003;19:288-92. Grosfeld JL, Ballantine TV, Shoemaker R. Operative mangement of intestinal atresia and stenosis based on pathologic findings. J Pediatr Surg 1979;14:368-75. Pathak M, Narula D. A case of duodenal atresia with apple peel appearance: Challenging the current embryology. J Clin Neonatol 2014;3:112-4. Ahmad A, Sarda D, Joshi P, Kothari P. Duodenal atresia with 'apple-peel configuration' of the ileum and absent superior mesenteric artery: A rare presentation. Afr J Paediatr Surg 2009;6:120-1. Weber DM, Freeman NV. 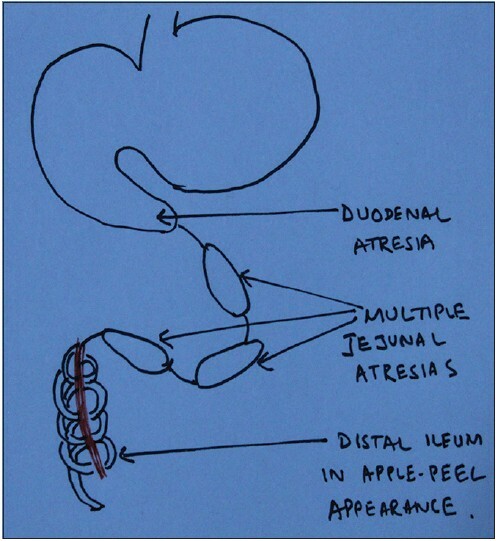 Duodenojejunal atresia with apple peel configuration of the ileum and absent superior mesenteric artery: Observations on pathogenesis. J Pediatr Surg 1999;34:1427-9.